It looks like you are searching for a reliable cryptocurrency exchange. And I must say you are in the right place. At TheMoneyMongers we believe in thorough research and recommendation. And this time also we have understood your need and went ahead in using numerous cryptocurrency exchanges in fast few weeks. Having said that we have come with a list of reliable cryptocurrency exchanges for beginners and advanced users alike. So based on these things we have curated this list of exchanges where you can buy/sell cryptocurrencies and altcoins in myriad different ways. PS: Do make an account on 3-4 exchanges using this list even if you plan to trade only on one of them because sometimes due to a massive influx of new users these exchanges suspend new registrations, having access to multiple exchanges is a good option. CEX.io is one of the oldest cryptocurrency exchanges operating in this space since 2013. CEX is based out of London, the UK which is believed to be a bit more relaxed environment for cryptocurrencies. I started using CEX in 2016, and since then it has been my go-to exchange to buy popular cryptocurrencies for fiat or BTC. 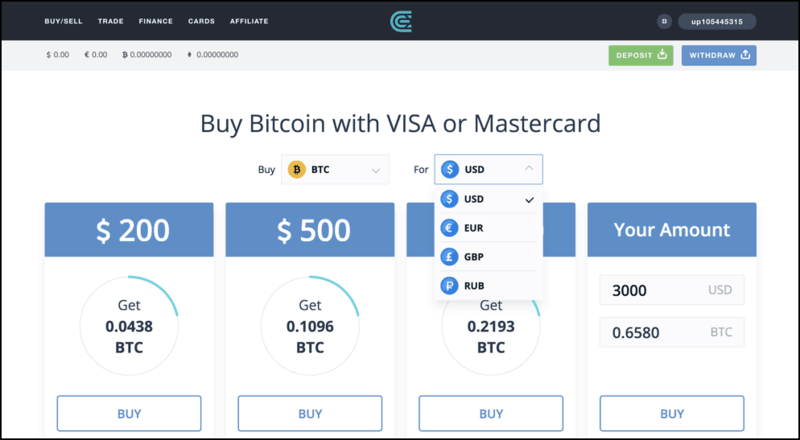 You can also buy BTC in various fiat currencies from CEX. But to get started on CEX you first need to register using your email ID and abide by their AML-KYC rules. Post verification (which can take up to 24 hours), you are free to deposit and trade using fiat currencies like USD or EUR. One thing that I enormously like about CEX is, it allows you to buy cryptocurrencies directly through your Visa/MasterCard but before that, you need to verify your card (it typically takes few hours to verify). Here is their official guide to help you out. Apart from that CEX is as safe as Coinbase and has excellent security features such as 2-factor authentication and 24/7 customer support. Want to buy/sell more variety of cryptocurrencies? Well, you should look at Coinmam then. Coinmama is undoubtedly the easiest and fasted way to buy cryptocurrencies for fiat from across countries around the world. The service is active since 2012 and has already served millions of customers, so you need not worry about their reliability. 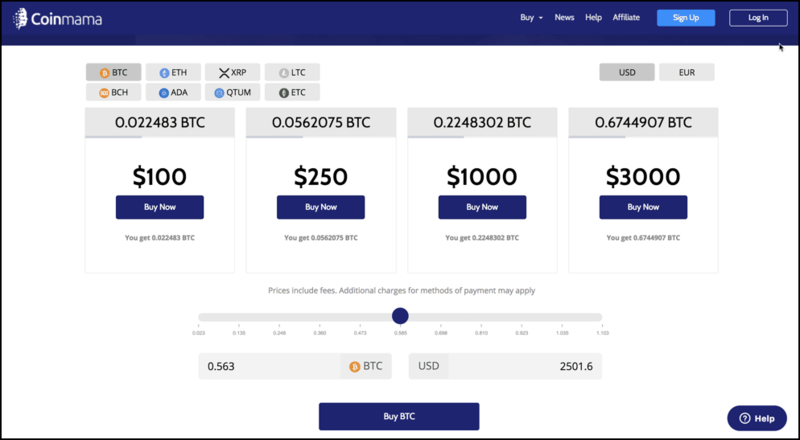 So virtually you can buy cryptocurrencies (8 cryptos) in any currency through your debit/credit card via Coinmama almost instantly. You already have BTC or ETH and want to trade other cryptocurrencies? Well, you must see then Binance cryptocurrency exchange. Binance cryptocurrency exchange has ruled the market in 2018, and it is likely to do the same in 2019. Binance is a crypto-to-crypto only exchange where you can trade 100s of tokens and cryptocurrencies by depositing BTC or ETH like currencies. Binance started in 2017 from China, and now it has become the biggest crypto exchanges in terms of liquidity and users. 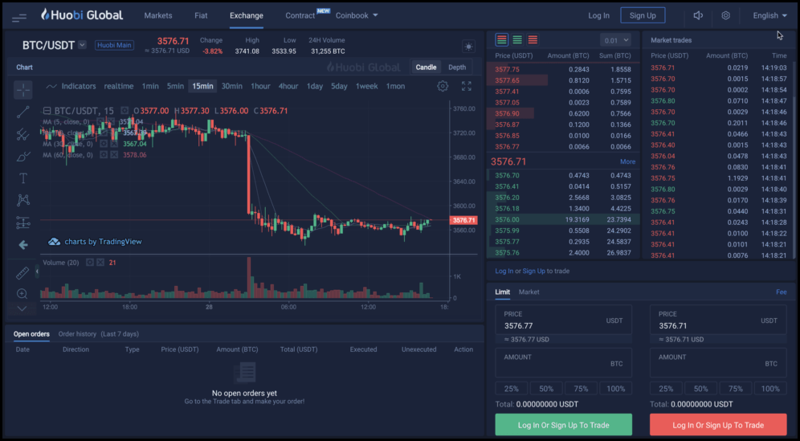 It is an order book exchange where crypto enthusiasts like you can place a real-time bid and enjoy other advanced charting features. With Binance exchange, you need not go through a rigorous KYC check, but if you want to enjoy higher withdrawal limits, you should complete a simple Binance verification. 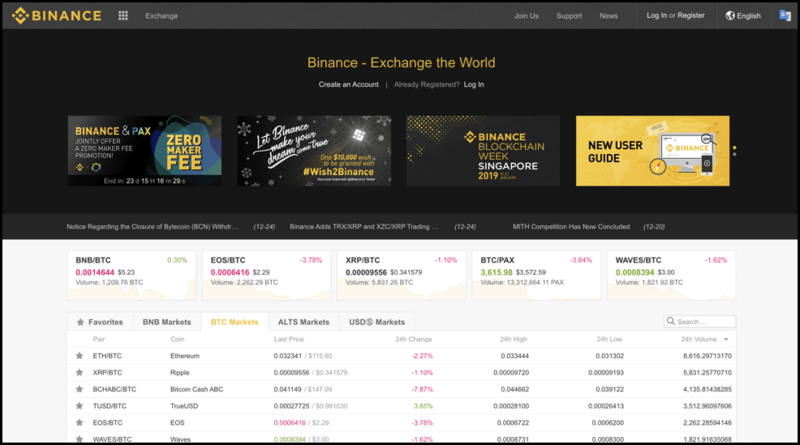 Lastly, regarding trading fees, Binance is one of the most cost-effective trading platforms because it charges only 0.1 % as a trading fee in which also you can get up to 50% discount if you opt to pay the trading fee in Binance Coin (BNB), as per the given schedule. Exmo is one of the fascinating revelations for us precisely because it has so many things to offer and the most important one, i.e., liquidity. For those of you who have ignored this order book style exchange, Exmo is one of the busiest exchanges in Eastern Europe in terms of volume and liquidity. 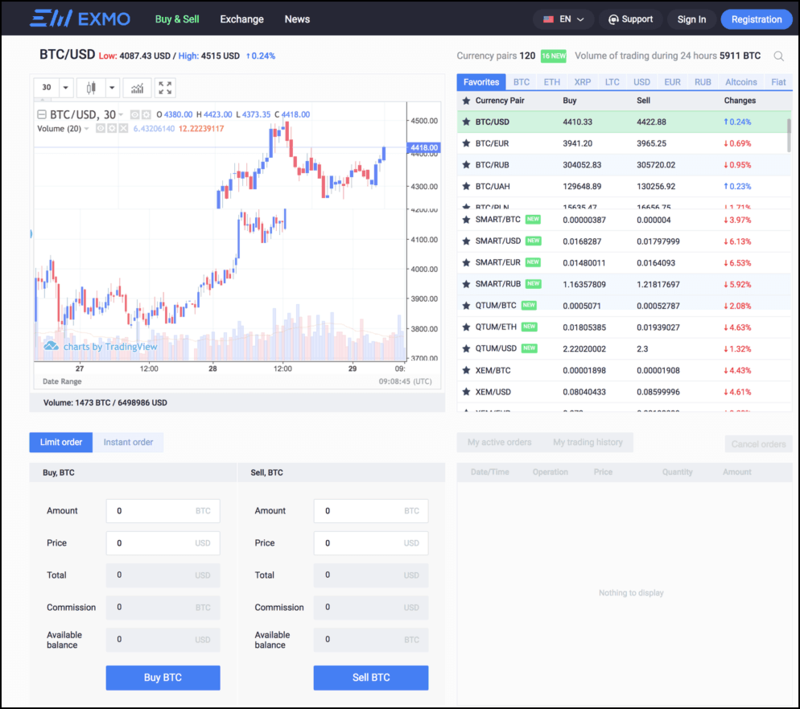 Exmo is based out of London, UK and has 1.5 million users with 315 000 daily visitors, 133 trading pairs, and dedicated BTC, ETH, XRP, LTC, USD, RUB markets. The monthly average trading volume is $1.5 bn. Getting started on Exmo is easy, and it only takes your email ID, to begin with, but for higher levels of freedom for dealing with fiat, you need to undergo identity verification, which happens quite swiftly here. This is their identity verification guide to help you out and here is their registration link. 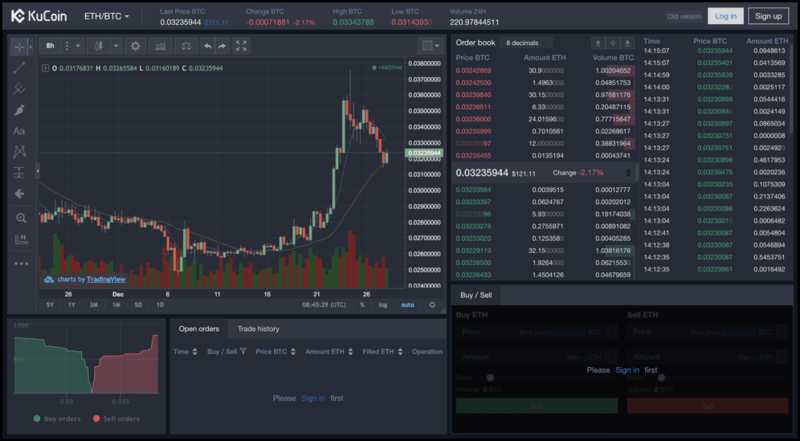 KuCoin-The People’s Exchange has also found its place here reason being its track record and the variety it brings to the crypto trading markets. KuCoin has more than 400 cryptocurrency pairs listed on it with decent liquidity of 4000+ BTC. KuCoin exchange also started getting traction in 2017 with its innovative bonus programme and number of coins it listed. Getting started on KuCoin is very simple as you just need to register using your email ID. Post which you can start trading on this crypto-to-crypto exchange, but it is recommended to get yourself verified because that will fetch you higher withdrawal limits. trading on this crypto-to-crypto exchange, but it is recommended to get yourself verified because that will fetch you higher withdrawal limits. But still, you can trade on this exchange without KYC or verification and even withdraw up to 2 BTCs per day which is a good amount by the way. Note: Verification can take up to 5 days so prepare accordingly. Lastly, its fee structure is designed in such a way that you can claim up to 30% trading discount by holding KuCoin Shares (KCS). For example: Holding every 1000 KCS results to 1% discount of trading fees, the maximum discount rate shouldn’t exceed 30%. Therefore, holding 10000 KCS results to 10% discount, holding 30000 KCS results to the maximum discount rate which is 30%. By holding KCS, you become also entitled to KuCoin’s bonus sharing programme in which you get daily dividends in KCS as everyday 50% of all trading fees earned by KuCoin is used to buy KCS from the market and then redistribute to userbase in appropriate proportion. Gate.io is another reliable exchange for trading cryptocurrencies and altcoins in 2019. Gate.io, which started getting attention in 2017 has very high liquidity and lists more than 350 cryptocurrency pairs on it. So liquidity shouldn’t be a problem here. 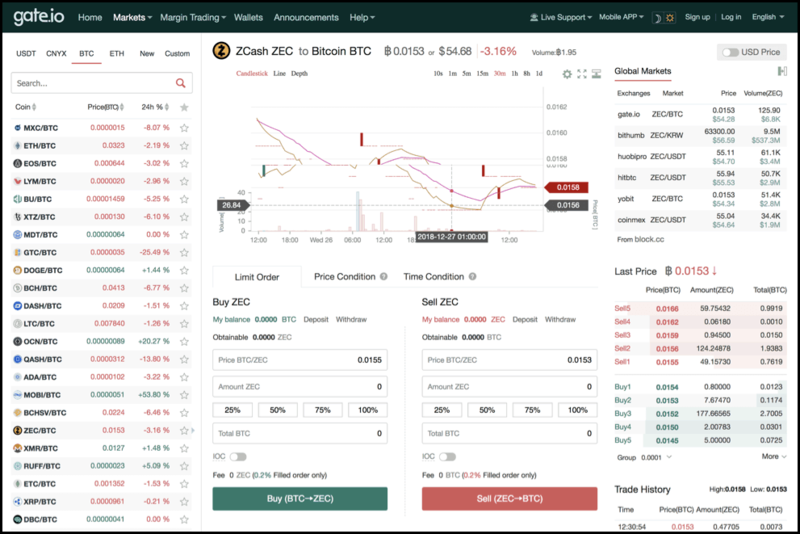 The overall trading fee on Gate.io is 0.2%, but you can get a 10% off on it. You get a special 10% trading discount for subscribing to Gate.io using this link and believe me 10% trading discount can make a huge difference over a period of time. Huobi is also known as Huobi Pro exchange, and it is operating in this space for a few years now. It originally started from China but has now moved across borders to expand its exchange operations. Now it is based out of Singapore, and as we speak, it sits on number #3 spot on CoinMarketCap in terms of the volume. Huobi pro has more than 350 cryptocurrency pairs listed on it and consistently maintains 100,000+ volume in BTC. Their registration process is also pretty simple and straightforward as you just require the email ID to begin with, so go ahead and do the needful. But Huobi has its native HT token and holders of this token can get up to 50% discount provided they avail for the VIP membership. Moreover, you can see what the best offers are available to you for a particular cryptocurrency pair that you wish to trade. So just buy, sell, trade over 300 cryptocurrencies, altcoins, tokens like Bitcoin (BTC), Ethereum (ETH), Ripple (XRP), Litecoin(LTC), etc. using CoinSwitch. Changelly is an instant cryptocurrency exchange/swap service, but it requires you to register using your email ID. But you can simply bypass this by using an alias email ID and in return, you will get access to a full auditable transaction history in your Changelly account. 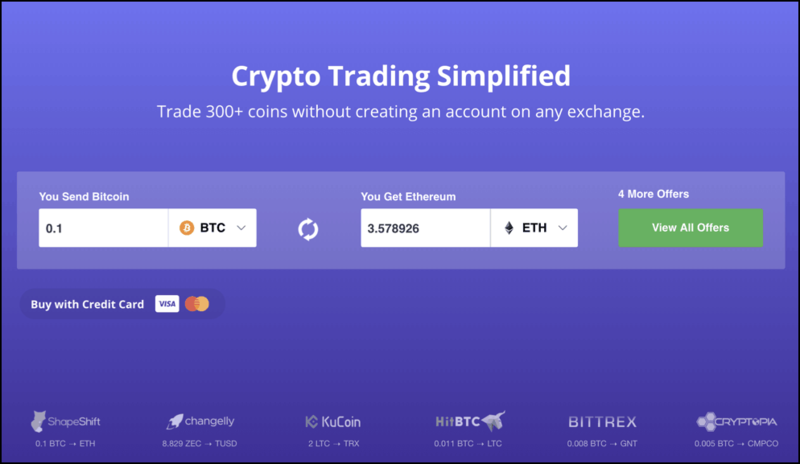 This is one of the easiest ways to swap cryptocurrencies directly without getting into the headache of order books. BitBay is one of the reliable crypto exchanges in Europe and is certainly one of the better cryptocurrency exchanges to use if you are living in the UK or Europe. And unlike Coinbase they are quite swift and have a much better customer satisfaction index when it comes to trading cryptocurrencies for fiat like USD, EUR, etc. Right now, Bitbay enjoys decent liquidity of 2000+ BTC where you can find 70+ cryptocurrency pairs. 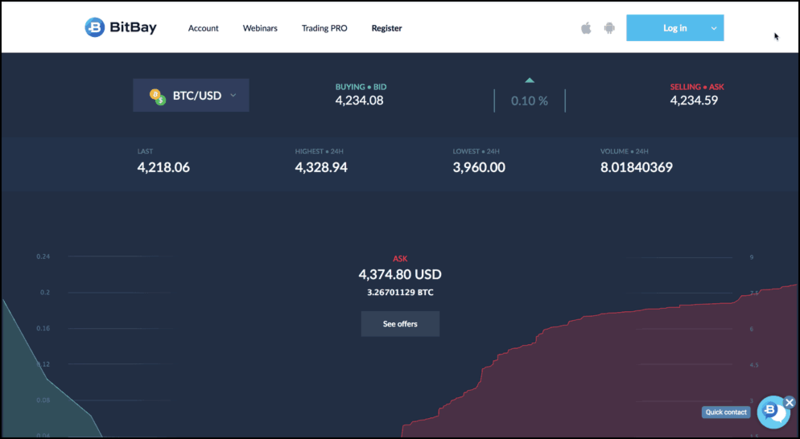 Apart from that BTC, PLN, USD, EUR markets are live on BitBay where you can trade crypto-to-crypto as well as crypto-fiat or vice-versa. Lastly, to get access to full functionality of the BitBay exchange, it is recommended to verify yourself by submitting your documents. Here is their official guide to help you with the verification and here is their registration link. Conclusion: Which Cryptocurrency Trading Sites To Choose? Selecting a decent cryptocurrency exchange can be a challenging task, given the fact we have so many options out there. You should not rely blindly on any exchange and should always check for its security measures, liquidity, coin offerings, customer support before deciding. I know some of you might be thinking, how do you we know about customer support? Well, we have used all these exchanges and have also confirmed it through some of the best cryptocurrency exchanges feedbacks through Reddit. Some of you might also be missing Kraken and BitStamp like exchanges, but sorry, I haven’t used them much hence have not listed them here. Furthermore, I hope you are smart enough not to keep your cryptocurrencies on these exchanges because no exchange is safe for cryptocurrency storage. Also, get yourself a hardware wallet like Ledger Nano S or Trezor which will help you save 90% of these cryptocurrencies that you aim to buy. Lastly, I hope this list helps you pick the right exchange; I would recommend you to have an account on atleast 4-5 exchanges because diversification in terms of exchanges is also an excellent way to minimize risk. But anyways, do share with us which exchange you finally choose?